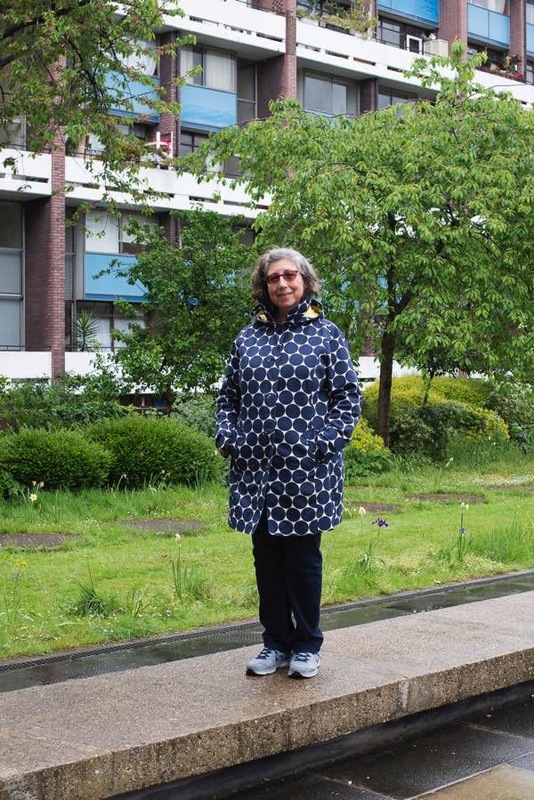 With council housing and long tenancies under severe threat, it was with a mixture of emotion that Contributing Photographer Sarah Ainslie & I set out with my choir chum Mal Gilliam across the Golden Lane Estate, one of London’s most successful post-war council estates, to see where Mal spent her childhood. 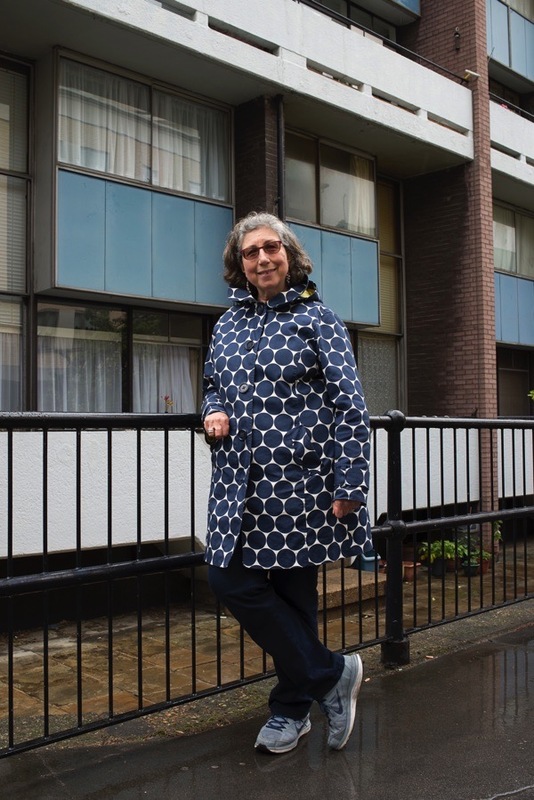 It struck me – as we wandered around – how these estates have provided the bedrock of community and continuity in London, and how – without them – we are heading towards a city solely for the rich and transient. “I was born in 1949, named after Marilyn Monroe, a favourite of my dad’s. When I was six, my parents and older sister, moved from the Wenlock Rd Estate, off City Rd, to Golden Lane. We were one of ten families who initially moved into ‘Cuthbert Harrowing,’ into a modern three bedroom flat with central heating. As a child I loved it here. I loved the freedom of it. Roller-skating down around Bowater House, and playing on the railings. The Estate discouraged ball games and noise even then, so the Community Centre was provided for the children. There was a youth club, and I took ballet classes there. A man called Joe Mitchell, he lived in Bayer House, he created a children’s variety show called ‘Joe Mitchell’s Follies.’ I was nine, I think, when I took part in a show that comprised of a medley of Gigi songs – and then the swimming pool was built, and it was luxury. Whitecross Street had an actual market every day, and there was a butcher, a fishmonger and two bakers there, before the supermarket forced them out. And on Bonfire Night, a large fire was lit on the concourse in front of Great Arthur House, and we all brought fireworks and set them off and there was baked potatoes and sausages for everyone. A rogue firework ending up in a girl’s wellington eventually put paid to that, however. Looking across the Barbican Centre and the towers now, it is hard to imagine that it was just a bomb site, stretching out as far as the eye can see. I used to climb over the wall and spend hours over there looking for caterpillars or playing hide-and-seek. It was incredibly dangerous really, unexploded bombs, shifting rubble which could fall away into deep cavities, and yet I never knew of anyone ever getting hurt. Years later, I looked out of my mother’s window across that same stretch of land and watched the Barbican being built. It was a fractious build, they had so many strikes. They all lined up in Fann St. If a chippie picked up a piece of piping, they walked out. Demarcation of work, it was called, and the unions were very strict, and it went on for years. Continual noise and dust. Golden Lane was an extremely successful estate and I think they selected families to be at the centre of it. People were happy to be there, they were proud of it. It was post-war. It was colourful. State of the Art. My aunt lived in ‘Great Arthur.’ My sister moved away but wanted to come back after her husband died. My mother knew the Housing Officer, who came and visited us and said that, as soon as a flat was available, she could have it. Lots of people brought their families over and many children of the original tenants still live on the Estate. For someone like me, who was shy and nervous as a child, it was as if there was a wall around me and I was protected. As a teenager, though, there was nothing around. The area was dead. Even the Aldersgate tube did not open on Sundays, so me and my friends went into Soho. I must have been sixteen, seventeen – I had left Parliament Hill school around that time – and we went to a coffee bar called ‘Le Macabre.’ It had tables shaped like coffins and we thought it was great, and we bought a coffee and sat there all night. When we wanted to dance, we went to the St Moritz club – where I met my husband Bill. Bill had a group of friends who formed a soul band – ‘I’m a Soul Man,’ ‘Stand by Me,’ those kind of songs. Well, Bill had saxophone lessons, but as soon as anyone else played with him he lost time, so he had to become the manager instead. He was down the St Moritz with the band one night, and we danced together. We got married when we were nineteen. Bill worked for a booking agent in the music business and I went to gigs with him. I saw Jimi Hendrix at the Saville. And one of the groups they managed was called Curved Air, and they opened for David Bowie during his Ziggy Stardust phase. I was pregnant in my Laura Ashley dress while he was beautiful and so thin and in make-up, and I was fascinated. In 1968, everyone was protesting Civil Rights, but Bill and I were saving to buy a house to give our kids something different from the Estate. I was working for the Conran design group and Bill was still in the music business and he did early morning cleaning jobs too. We saved up £1,500 for our first deposit in the seventies and Pink Floyd roadies helped us move. We had a farm workers’ cottage near Oxted. It was stockbroker belt, all fences and no public land. Imagine coming from the middle of London and being stuck there. I missed the community. I felt isolated. I did eventually make friends but, every couple of weeks, me and the children got into Bill’s van and he brought us back into London, and I would come over the bridge and see the Thames and my heart started beating again. Years later we did move back to London, got a house on the borders of Highbury and Hackney, and I got a job and learnt to drive. But I am a Londoner through and through – that is me. I have a fantasy of having a dog in the country but that is all it is. I need a destination when I walk. And a coffee at the end of it. I survived those five and a half years but I was not alive. When my mother died, we did come back to live on the Estate for twelve years. Bill is interested in architecture, especially Corbusier, an interest that took us to stay in the Corbusier building in Marseille, so he loved living here. Eventually, though, the noise from the pub downstairs became overwhelming and we moved out. Lovely to hear about Mal’s memories. “councils have a responsibility for people”, I couldn’t agree more. That’s an interesting story and I am with you completely – council housing all the way. The right to buy scheme has totally screwed up council housing. The housing polices of this government,and its predecessor, fail to recognise community. I am fearful for London. Last year I was talking to a curator from the Whitechapel Gallery who said the full on free marketisation of London’s social economy was leading to a monstrous situation in which the city was like a creature eating itself. I hope mayor Khan and his team can make a difference and but a break on the gluttony. I am a 100% Northerner who loves Manchester and, more latterly, Liverpool but recognise London has magical energy, a pulse I can taste on the air when I step off the train at Euston. I like to come at least once a year to get my fix: visiting districts, arts and theatrical events and spending time by the Thames. From the Strand on the Green to Greenwich, from the Dove to the Grapes there’s an intangible quality that energises. Who could be bored? When I think how local people, ordinary people on lower wages or or on benefits are being priced out and discounted by a government run by elites, I could cry. the NHS and Council housing would saved. How do so many ordinary wonderful folk end up being “governed” by the elite? I love this estate we brought up Oliver our son here for two years, before moving to eleven and a half Fournier street as residents of the city of London at he time i was working as an assistant to James Stirling and my wife training to become a teacher this was a blissful period the facilities are indeed wonderful for families with a teaching pool and tennis courts. There is a real sense of community here, something to cherish in central London where people seem to be on the move all the time. The buildings won an award for their design, the Architects Chamberlain Powell and Bonn then went onto to design the Barbican centre. the efficient layouts and sense of open space is a wonderful thing. the acoustics could be improved however this seems a small gripe! I was fascinated by Mal’s poignant and happy memories. It’s wonderful how paths cross, diverge, and cross again much later: I remember Bill from the mid-1970s, when he owned the Panda bookings agency and I was the drummer in a minor rock band called Dogwatch. We met only once, I think, but even 40 years later I have not forgotten the warm friendliness and good humour of his communications by letter and phone – very rare in the music business! He will know that Curved Air are still going strong with original members Sonja Kristina and Florian Pilkington-Miksa; I hugely enjoyed their gig at a small club in Chislehurst last year. I gather that in his retirement Bill is an enthusiastic photographer of architecture. He might like to look at my book of photos of office workers in the streets of the City of London and around Canary Wharf, ‘Lost in the City’, recently published by Hoxton Mini Press. Greetings to you, Mal – and do give my best regards to Bill! Love Golden Lane. Proving that high density housing can work with green open spaces. Pity later council estates weren’t so well designed but the right to buy has created an odd situation where wealthy people live in privately owned former council flats next to council tenants. Thus others in need of council homes don’t get a chance to live in London. It’s those people who will be the nurses, shop workers and such to serve those who can afford the high house prices and rents in London. Great piece of local interest that has serious connotations for the City as a whole. Council housing should never have been sold off and now we are seeing the result of this ideologically driven policy. We should be building more Golden Lane estates for people to live in, instead – thanks in part to the idiot Boris – we are getting developments such as One Blackfriars, where a studio apartment will cost a million quid. This is untenable for the future of London as a living city. We don’t need any more millionaires in London, we need people who live and work here but this government has made it clear that their plan for London doesn’t include working people. Local communities are an anachronism today and everything must conform to a corporate blueprint designed by business, for business. Even Spitalfields has been bowderlised to a point where it is almost like an exhibit at Disney’s Epcot centre at times. London is and will always be my home but I don’t want to live in a zoned theme park. This piece and all the comments make very interesting reading for me. I grew up in a very very rural spot with only one close neighbour, the next house being half a mile away, but I can understand the feeling of living in a close community that these people, Mal and the others, have. However we, as country children also had great fun as we were free to explore the fields and lanes and hedgerows, all day long when we were not at school, we did not, and I still do not, like to be surrounded by buildings and pavements, but spitalfield’s life has made me realize that there is so much history in London that I have become completely fascinated. thank you Mal and everyone else, you too GA, for making that possible. I agree completely about council housing as well, decent housing should be provided for everyone at affordable rents. What I have learnt about the situation in London now makes me despair! “these estates have provided the bedrock of community and continuity in London, and how – without them – we are heading towards a city solely for the rich and transient.” – Totally agree. We need a Council House building programme but this government for the rich won do it. What a wonderful story! I’ve known Mal for 16 years and been treated to some snippets of the story over the years but lovely to hear it in this way. Funny that we dream of things like the countryside that we don’t actually want! Love to you always Mrs Gilliam! That estate is nestled into a particular and rare pocket of London just inside the City of London…quite a special place where everything is within walking distance and the whole place goes quiet on a Sunday. For council flats they are of a high quality and the space is well thought out. Lucky tennants. Very nice piece. I lived in Bowater House from 1984 till 2001 and then in the Barbican. I moved out for quite a while, but 4 years ago, was lucky enough to get back to Golden Lane in Crescent House, and it feels great to be home. Once Londoner always a Londoner! Born in 1961, I spent a very large part of my childhood at 62 Whitecross Street, where my grandparents lived in a Whitbread house. (Grandad was a Whitbread manager for many years after serving 29 years in the Royal Artillery). This brings back so many memories of the time spent watching the Barbican estate being built, going to the Golden Lane swimming pool, visiting the Whitecross Street market daily before Safeways built their new supermarket on the site of the Whitbread Tanyard; and ruined the livelihoods of many a market trader, going to see the shire horses in Garret Street; that pulled the Lord Mayors Coach, The Kings Head pub, on the corner of Chiswell Street and Silk Street (opposite Whitecross street), walking to Petticoat lane market, via Moorgate and Bishops Gate, going to the first opening of the Barbican Arts Centre and the Barbican Museum (City of London Museum), being able to go into the arts centre any time I wished and watch the many free musical ensembles sharing their talent with the general public, and walking around the estate on the highwalk in the middle of the original London Wall, with the old chapel and big fish ponds remaining right in the centre. Thanks for sharing this Mal, the memories flood back as if they were yesterday; not 43-50 years ago.